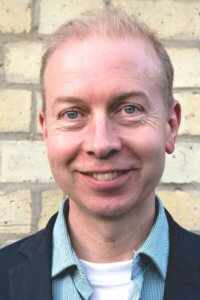 David has been Chief Executive of Britten Sinfonia since its foundation in 1992. He produced the first business plan for the orchestra and has overseen the exciting emergence and development of Britten Sinfonia from humble beginnings to its pre-eminent position as one of Europe’s leading orchestras. As Chief Executive and Artistic Director, David is responsible for the artistic and business planning of Britten Sinfonia. He produces the artistic plans of the orchestra in consultation with the rest of the artistic team, Britten Sinfonia musicians and the senior management team. David was brought up in Ross-on-Wye, was a Hereford chorister and studied at the University of London Goldsmiths’ College. He worked at the Academy of St Martin in the Fields from 1986 to 1989 managing the Academy Chorus and the orchestra’s UK touring. From 1989 to 1992 he was General Manager of National Youth Music Theatre and developed the NYMT’s profile overseas with tours to Japan and the USA. Part of his role also included programming events at the Edinburgh Festival’s George Square Theatre. As well as promoting a variety of acts including Paul Merton, the Mary Whitehouse Experience, the Reduced Shakespeare Company and Kit and the Widow, he also produced the theatre version of Ned Sherrin’s popular BBC Radio 4 talk-show, Loose Ends, and a successful sketch show with Willie Rushton and Simon Rae. David served on the Board of the Association of British Orchestras from 1998 – 2005 and is a Trustee of the National Youth Orchestra. In 2013 he was the ABO/Rhinegold Orchestral Manager of the Year and is an Honorary Associate of the Royal Academy of Music.